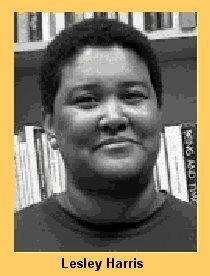 Leslie Harris, who teaches U.S. and African-American history, has just been promoted to Associate Professor with tenure. Here she summarizes her forthcoming book. Few are aware of the long history of slavery in the northern states, and particularly New York City. My first book, In the Shadow of Slavery: African Americans in New York City, 1626-1863 (University of Chicago Press, 2002) calls attention to the ways in which New York City was dependent on slavery for two centuries--from 1626 to 1827; and the ways in which that history, as well as the continuation of southern slavery until the Civil War, affected the lives of New York City's African-Americans. As in the South, black slave labor was central to the day-to-day survival and the economic life of Europeans in the colonial North, and no part of the colonial North relied more heavily on slavery than Manhattan. By the end of the seventeenth century, New York City had a larger black population than any other North American city. The ratio of slaves to whites in the total population was comparable to that in Maryland and Virginia at the time. In the eighteenth century, New York City was second only to Charleston and New Orleans in the number of slaves it held. The existence of slavery in New York had an indelible effect on the political and economic institutions of the city. In the colonial period, slave labor was central to the growth of the city. However, by the time of the Revolutionary War, slaves symbolized the condition whites most feared for themselves as workers and citizens. A condition approximating black slavery was the worst possible outcome of the Revolutionary War with Britain. Whites' fears and critiques of their own enslavement, based in republican ideology, did not, however, lead them to emancipate their slaves during the war. In 1785, the founding of the New York Manumission Society signalled a new attention to the problem of slavery. In 1799, New Yorkers passed their first emancipation law. However, white New Yorkers attempted to define and contain the free black community based on their assumptions that the experience of slavery had degraded blacks. Through the provisions of the gradual emancipation laws, and the 1821 suffrage law that disfranchised the majority of the black community, white New Yorkers again selectively enforced republican virtues. They defined blacks as a special dependent category within the New York City community. By the end of the period of emancipation in 1827, whites saw blacks as a separate and unequal group within the community. In response, New York's blacks searched for ways to prove their equality. The roots of class distinctions in the black community lay partially in differing responses to racism. The seeds of a black middle class were planted during the emancipation era as some black ministers, educators and skilled workers looked to the New York Manumission Society for guidance. This coalition's attempts to control blacks' public displays, education, work habits and religiosity resulted in conflict within the black community. Throughout the antebellum period, debates over methods to achieve social, economic and political equality both revealed and contributed to the evolution of class distinctions, an evolution that would not be complete until after the Civil War. The rise of radical abolition marked another period in the evolution of blacks' class identities in New York City. Between 1830 and 1840, blacks turned from the tactics and ideologies of the New York Manumission Society, which increasingly advocated colonizing free blacks in Africa, to those of radical abolition. As part of the abolitionist coalition of the 1830s, free blacks were crucial to whites' acceptance of the goal of immediate emancipation of southern slaves, and the doctrine of black equality. However, the moral perfectionism of the abolitionist coalition again contributed to class divisions in the black community. Some blacks, regardless of class background, subscribed to the moral and intellectual reforms promulgated by abolitionists as the best way to achieve economic and political equality. But others saw in such reforms the growth of class distinctions within the black community, and protested against the privileging of middle-class, educated blacks and their tactics for racial improvement. The breakup of the abolitionist coalition and the rise of a new group of black leaders in the 1840s and 1850s led black abolitionists to place a greater value on manual labor rather than moral perfection as a method of racial uplift for blacks. However, black abolitonists distinguished between meaningful skilled labor, and "degraded" occupations such as domestic service and waiting tables. Such distinctions grew out of a general ideology about labor in the antebellum period, rooted in republican thought, which devalued personal service occupations as not providing workers with sufficient independence from employers. Among blacks, such distinctions also grew out of the experience of slavery, in which domestic and other personal servants were more subject to the will of their masters than other workers, and at worst, were also subject to sexual abuse by them. However, the majority of black women and a large proportion of black men worked in such occupations under freedom. With noteworthy exceptions, black abolitionists were unaware of the efforts these men and women made to retain their autonomy. Further, the occupations criticized by black abolitionists could and did provide the basis for mutual respect between black and white workers and an alleviation, albeit temporary, of racial tensions. In 1853, New York's black and white waiters joined together to ask for higher wages. Black waiters' pride in their work and resulting belief in higher wages gained them the reluctant respect of their fellow white waiters. But the 1853 waiters' strike was not the only instance of cooperation and contact between black and white laboring-poor. Black and white workers shared class-based neighborhoods throughout the antebellum period. They participated in social and cultural activities after work in interracial bars and dance halls, and sometimes married. After 1834, white journalists focused on these relationships and created a discourse of amalgamation that sexualized and criminalized black-white interactions in the public eye. By the beginning of the Civil War, the allure of the rich political, social and cultural interactions that blacks could achieve in New York City had grown thin in the face of continuing poverty and increasing racism. After years of growth, New York's black population dropped precipitously between 1840 and the Civil War, from a high of over 16,000 in 1840 to about 12,500 in 1860. The decrease in population was due partially to the influx of Irish immigrants, who competed with blacks for unskilled jobs. But it was also due to increasing danger against blacks in the wake of the 1850 Fugitive Slave Law. Blacks looked beyond the boundaries of New York City to the possibility of farming communities in upstate New York, the West, and Canada. Some also embraced emigration to Liberia and the West Indies, in cooperation with the white-led American Colonization Society that had been rejected by blacks earlier in the century. Despite the decrease in the black population however, the rise of the Republican Party and its limited form of anti-slavery was threatening to white New Yorkers who were pro-slavery and against black equality. Soon after the Civil War began, some white working-class New Yorkers turned their backs to the limited promise of racial cooperation and equality implied in the relationships between blacks and whites in the waiters' strike and the Five Points. In the worst anti-black riot of nineteenth century New York, the Civil War Draft Riots of 1863, the antebellum period ended for blacks as it had begun soon after the War of 1812: with attempts to expunge blacks, this time by violent means, from New York's social, cultural, political, and economic life.